High quality red herring caviar is small, fine and less salty. It is perfect for decorating various dishes, preparation of delicacies and as a side dish. Abba selects only the best caviar, which is aged in barrels under a specific temperature until it is excellent. 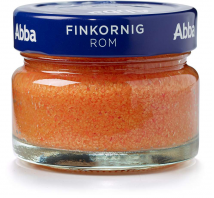 In 2009, Abba was the first company in Europe offering caviar, which doesn’t contain azo dyes. All Abba roe are marked with the MSC (Marine Stewardship Council) label, which certifies Abba respect for the natural resources. Packaged in 80 g jars. Expiration date: 8 months. Catch: herring (Clupea harengus) roe – Norwegian Sea, North Sea. 100 g of product contains: energetic value – 350 kJ (86 kcal); 4.5 g fat (from which 1.5 g saturated fat acids); 3.5 g carbohydrates (from which 1.7 g sugar); 7.5 g proteins; 5 g salt.